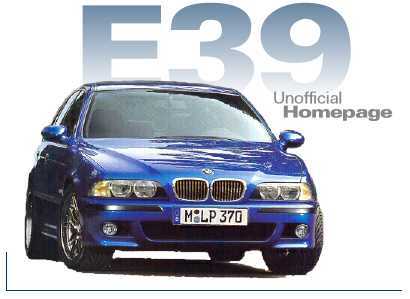 The Unofficial E39 Home Page. Dedicated to the BMW 5-series years 97-03. Got squeaks in your interior? Solve them using this article. Installing a rear child seat. No 3rd seat for the Touring models. It's the crumple zone stupid! Belt squealing? Here is some troubleshooting help. Heard about the high sulpher level in USA gasoline causing problems with BMW V8s? Shouldn't be a problem with an E39. Bekkers is the only source for these I can find in the USA. Upgrading to Xenon? You'll want to know about these gotchas! Installing factory rear foglights in your E39. Installing a Valentine V1 radar detector in your E39.